If you’re a translator who works with texts that are not confidential, your best bet would be to choose Google Translate (of course, it also depends on your language pairs). If you translate mostly confidential texts and your clients require maximum privacy, then SD could help you leverage your language data. seems to have intrigued some readers. Is GNMT really better than a Slate engine? Why build a SMT engine when NMT is already available? …. and other questions. I have a post planned about all this as soon as possible. I have kept my test of Slate Desktop as basic and as quick as possible to see if it was really simple to build an SMT engine. But of course, the devil is in the details. So, I invited Tom Hoar, Slate’s CEO, to give a more technical overview of what needs to be taken into account when building and evaluating your own engine. We also agreed on a test to see who was the best: Slate or GNMT. You can read it in the guest post underneath. By the way, if you’re a blogging translator and are willing to invest some time in testing Slate, you might want to join Slate’s Blogging Translator Review Program. Slate’s evaluation scores do not tell you about the quality of an engine’s translations. Instead, Slate focuses on describing engine criteria can be measured objectively. Here, I generically refer to these criteria as an engine’s “linguistic performance.” The scores indicate how an engine might reduce or increase a translator’s workload compared to another engine. With objective evaluation scores, you can better predict how an engine might affect your work efficiency in the long term. Before I could compare the performance of Isabella’s engine to Google, Isabella graciously granted me permission to translate her evaluation set’s 2,353 source segments using Google Translate. 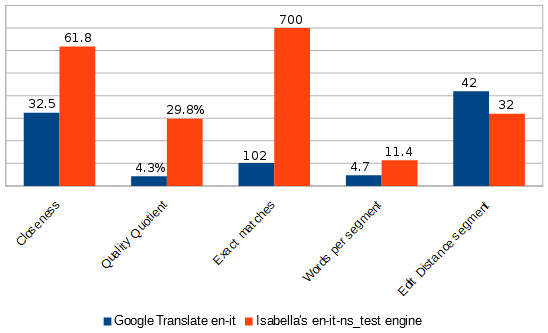 Here are Google’s evaluation scores side-by-side with Isabella’s. The average segment length of source segments in the evaluation set tells us if Isabella’s translation memories are heavily weighted with terms, such as from a termbase. Isabella’s 16.5 average above is normal and the translation memories likely include a good balance of short and long segments. If the average were very small (for example 5 words), the engine will work poorly with long sentences. Isabella’s evaluation set is a representative subset of the corpus that Slate created to build the engine. The evaluation set’s scores show that her engine significantly outperforms Google Translate in every measured category. Furthermore, because of how Slate created the evaluation set and her translation memories are primarily her work specific to her client, she has a 95% likelihood of experiencing similar performance with future work from that client. When Isabella works on projects with Slate, her engine is likely to give her 7 of 10 segments that require changes (the converse of the QQ). Like many users, she might find these suggestions overwhelming because she’s accustomed to the CAT hiding the suggestions from poor fuzzy matches. Still, 70% represents much less work than the 96% she would likely receive from Google. With a little practice, it’s easy and fast to trash segments that require radical changes and start from scratch. Fortunately, Isabella doesn’t face an either-or decision. Isabella’s first Slate Desktop engine performs well with her client’s projects, but we don’t know how it will perform with other projects. Fortunately, it costs her nothing to try it or improve it. Finally, she can also use Google whenever she feels it might be beneficial. Futurebound: Are We There Yet?